William Cook - Writer: News and reviews. Been having a few small successes recently with the publication of a few short stories in some quality Horror anthologies. 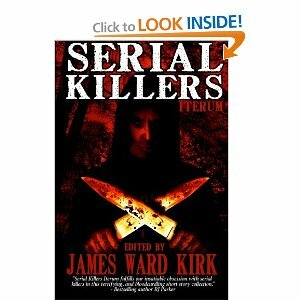 The first is James Ward Kirk Publishing's Serial Killers Iterum of which I have a few poems and a short story titled Return of the Creep which has received some good feedback. Serial Killers Iterum is a collection of poetry, flash fiction pieces and short stories, all edited by James Ward Kirk, under the umbrella of his publishing company of the same name. Kirk has brought together some of the darkest works I have encountered in a very long time and many of the pieces, can only be described as sinister and taboo. From the first poem, which is The Rebel, by Brian Rosenberg, the reader fully understands what is at the heart of this anthology. Rosenberg brings us the facts, fast and honestly; a serial killer, a successful one that is, will hide in plain sight. He will be in the cubicle next to ours, and be the model employee until he goes home and removes the mask of John Q. Public, to become a killer with multiple victims. Of the twenty-six poems in the anthology, my favorites were Rosenberg's The Rebel, William Cook's Killer, A. B. Stephen's Serial Killer's Ditty, and Three in Me by David Frazier. All the poetry ranged from good to great and all are worth your time. Like the poetry, the Flash Fiction is dark and menacing in its tones and variety. Being the father of an 8 year old daughter, I could identify with the main character and his motives, right up until the end in Stephen Alexander's Grey. But the ending does leave the door of uncertainty open, just a crack. There are 9 pieces here and Grey is one of the best. Brian Barnett's Business is Murder and Allen Griffin's Pretend Pain were excellent reads that weigh on the mind long after consumption. As for the short stories, William Cook's Return of the Creep, a tale of a sadistic cabby and his slow torture of a beautiful young girl, was by far the fullest, most well rounded story. Many of the other pieces read like flash fiction, but here, Cook offers the reader one of the best stories I have read in to this point in 2013. Zach Black's His Father Before Him,is another fine tale about a second generation serial killer who wants to be just like his dad, in every way but one. Also good is Mark Fewell's Amy's Last Dance. After reading the material here, I felt as if I'd been given a different view of the psycho serial killer than can be found anywhere else. This isn't true crime fiction, and it isn't Investigation Discovery, this is a group of writers taking on one of the most difficult sub-genres of speculative fiction, and doing an excellent job at it! Overall, I'd call Serial Killers Iterum a winner! After reading the material here, I felt as if I'd been given a different view of the psycho serial killer than can be found anywhere else. This isn't True Crime Fiction, and it isn't Investigation Discovery, this is a group of writers taking on one of the most difficult sub-genres of speculative fiction, and doing an excellent job at it! It's one of those anthologies you should not read in one setting, but over a long period of time. Theme fiction can sometimes be overwhelming when read straight through and, each Poem, Flash Fiction Piece, and Short Story deserves its own moment in the dark! The next anthology to have another story included in is Rainstorm Press' I'll Never Go Away II with my story Dead Memories.